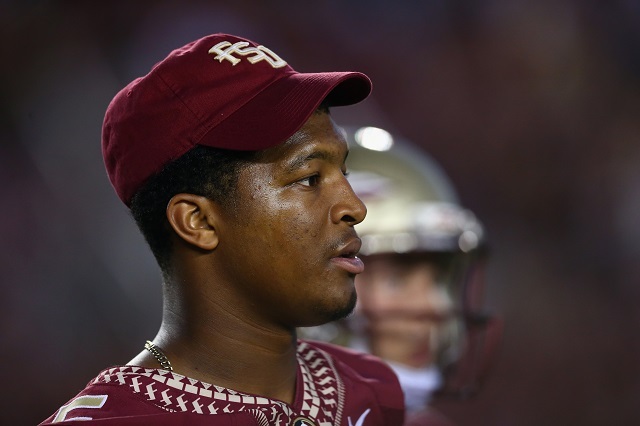 Did Jameis Winston’s Crab Leg Explanation Make Things Worse? Last April, quarterback Jameis Winston, the projected No. 1 overall pick in the 2015 NFL Draft, was issued a citation for shoplifting crab legs and crawfish from a Publix in Tallahassee, Fla. At the time, Winston took responsibility for his actions, was ordered to do community service, and was suspended from the Florida State baseball team until he completed the required 20 hours of service. End of story. Or so we thought. Well, a week before was my buddy’s birthday and we had got a cake. We met a dude that worked inside Publix and he said, ‘Hey, anytime you come in here, I got you.’ So that day, we just walked out and he hooked us up with that. And when I went to get crab legs, I did the same thing and he just gave them to me and I walked out. And someone from inside the store had told the security that I didn’t pay for them and that’s how the whole thing started. It’s shouldn’t come as a shock that top-tier college athletes receive certain benefits — just consider the comments made by former NFL defensive end and current ESPN analyst Marcellus Wiley. But with this new information, the entire shoplifting story changes. And if you think about it, that should be disconcerting. It’s important to remember that this episode was filmed prior to the NFL Combine. With that in mind, it should be safe to assume that Winston probably told the truth to every team he’s met with since. And if those organizations felt comfortable with these new developments, then Winston probably didn’t hurt his draft stock whatsoever. Still, for a guy who’s trying to convince everyone that he’s grown up and has learned from his mistakes, this new story doesn’t help his cause. Either way you slice it, Winston didn’t pay for the items. Perhaps it even seems more encouraging that he didn’t just swipe the crab legs. But what reason did he have not to be forthcoming right off of the bat? That’s what concerns us the most. Was he afraid of potential NCAA infractions? Was he covering for teammates who may also have been hooked up by that same store in the past? No one really knows except Winston himself. And in light of recent events, can you really believe anything he says at this point? With a little over a week until the NFL Draft gets underway, you can be sure that teams have already formed an opinion in regards to the polarizing quarterback. Some franchises probably believe Winston has moved past his off-the-field incidents and is ready to be the face of an organization. Other teams may believe he still has some growing up to do. Opinions will surely vary. Winston will be one of the first two quarterbacks selected in this upcoming draft. That much is certain. We just wonder if this latest development will work in the quarterback’s favor or against him. We’ll know soon enough.